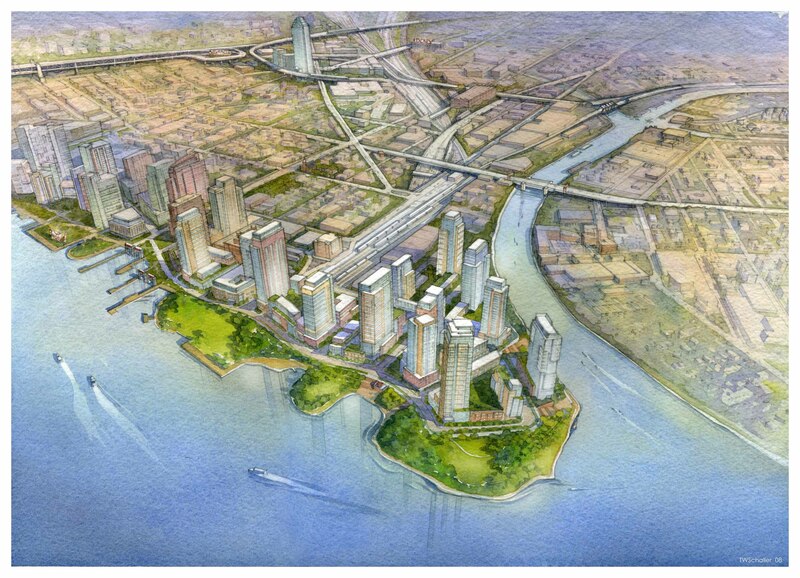 Proposed Hunter’s Point South development. Image: FXFOWLE Architects, LLP, Tom Schaller. Opponents claim Hunter’s Point South will not adequately address lack of affordable housing in Queens. On August 13, 2008, the City Planning Commission heard testimony on the Hunter’s Point South Redevelopment Plan. The plan aims to create an affordable, middle-income community and waterfront park on 30 acres of Long Island City waterfront. Originally owned by the Port Authority of New York and New Jersey, the City purchased the site in 2006 and assigned the New York City Economic Development Corporation to create a plan that would increase the affordable housing stock in Queens. In 2007, EDC announced a plan that included low-, mid-, and high-rise residential areas, 11 acres of open space, ground-floor retail, and approximately 5,000 new housing units, 60 percent of which would be affordable to middle-income families. At the Planning Commission’s public hearing, an EDC representative stated that, out of all the major U.S. cities, New York City has the smallest number of middle-income families, and that the EDC plan, the largest affordable housing project in the last 30 years, will allow the City to prevent more middle-income families from being priced-out of living in Queens. Helen M. Marshall, Borough President of Queens, testified that without more affordable housing, City workers, who provide vital services and “represent an important part of our tax base,” will continue to leave the City. According to Marshall, EDC’s plan can help reverse that trend. Ruth Viznauskas, Assistant Commissioner for new construction finance at the Department of Housing Preservation and Development, also spoke in favor of the plan. She stated that the affordable component of the plan targets families of four that have a combined income of $55,000-$158,000. Viznauskas added that the community had requested more units be made affordable for families making less than $55,000, but she stated that doing so would create a significant funding gap. According to Viznauskas, the original plan called for 100 percent of the units to be rentals, but HPD added a home-ownership option in response to the community’s request. Elena Conte, representing the Pratt Center for Community Development, voiced her disapproval of the current plan. Of the proposed units “not one would be affordable to a family of four making less than $61,450,” she stated. According to the Pratt Center, more than sixty percent of Queen’s households earn less than the proposed minimum affordable income of $55,000. Conte also asked HPD and EDC to share their financial models with the Pratt Center so it could verify HPD’s position that providing affordable units for those making less than $55,000 was not economically feasible. A number of local residents also voiced their opposition to the project’s lack of affordable units. Hanna Weinstock, a community organizer with Queens College, testified that it is “completely unacceptable that a publicly financed project on public land” excludes the majority of families living in Queens. Weinstock suggested that 20 percent of the units be affordable to those making less than $25,000, and 30 percent of the units be affordable to those making less than $48,000. This would ensure that 50 percent of the units are within the price range of those at or below the median income for Queens’ residents. The Commission has until September 29, 2008 to vote on the proposal. CPC: Hearing on Hunter’s Point South (C 080381 MMQ – rezoning); (N 080363 ZRQ – text amend. ); (C 080276 MMQ – City map amend. ); (C 080364 PQQ – acq. of property); (C 080365 HAQ – UDAAP).